Chris Hicks, NP, Advanced Wound Care Center, and Rachael Pepper, R.N., Advanced Wound Care Center, treat wound care patient Matt Case. COOKEVILLE – For most people, a cut, sore or surgical site is easily treated at home with antibiotic ointments and bandages. For some, a wound that’s difficult to heal is not only unpleasant, it can also lead to life-threatening complications. Muscles, tendons and bone can be left exposed by a wound that won’t heal, leaving the patient susceptible to infection, gangrene and, even, amputation. 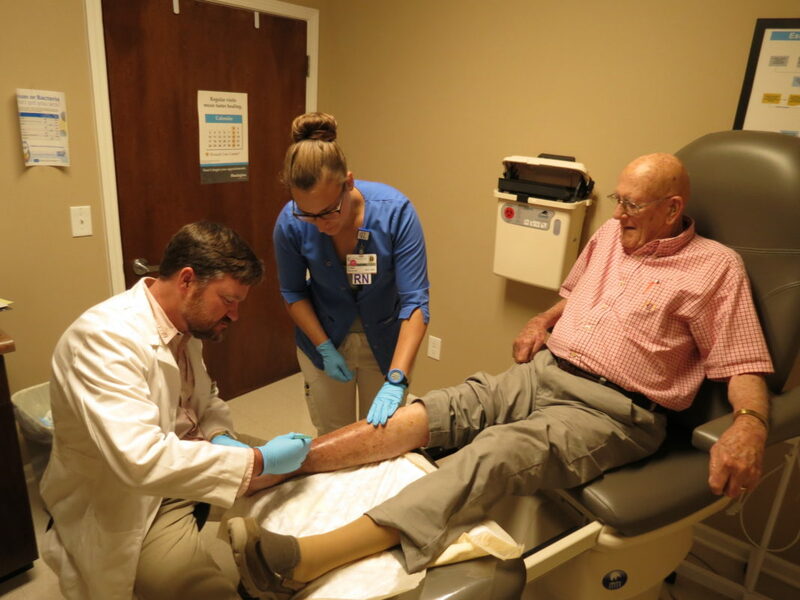 The Advanced Wound Care Center, an outpatient chronic wound treatment center at Cookeville Regional Medical Center, specializes in helping patients with chronic wounds heal faster by using tailored treatment plans. CRMC partners with Healogics, joining nearly 800 hospitals across 46 states who utilize the company’s advanced healing techniques and support, to treat patients suffering with chronic wounds. The Advanced Wound Care Center at Cookeville Regional is one of eight such Healogics-partnership centers across the state and is one of only two such centers in the UC; the other being located in Jamestown at Jamestown Regional Medical Center. The Advanced Wound Care Center at CRMC first began seeing patients in July 2015. Today, the center now records an average of 575 patient visits per month with nearly 50 of those being new patients. As the center closed in on its three-year anniversary on July 22, Jason Wyatt, the center’s program director, spoke of the milestone. Compared to last year, the center has seen a 21-percent increase in the number of patients seen; reporting roughly 3,100 patient visits in the first half of 2018. “Right now we’re averaging about 30 wound care encounters (patient visits) a day,” Wyatt told the UCBJ. The most common wounds treated at the center are related to diabetes diagnoses; 40 percent, to be exact. Of those, most patients are experiencing ulcers of the lower extremities. Another 15 percent are related to venous leg ulcers. Pressure ulcers account for another 15 percent of those cases treated by the wound care center. The staff at the wound care center also treats burns and trauma wounds. The center’s median number of days to heal is 29 while the average number of days to heal is around 40. The comprehensive heal rate, which consists of those patients whom the center plans to treat and who will visit the center at least twice during their course of treatment, is between 75 and 80 percent. Noncompliant patients, or those who opt not to follow all of the guidelines of their individualized treatment program, have an impact on the heal rates. “(A) 75-percent heal rate is still really good under those circumstances,” Wyatt said. Unlike noncompliant patients, patients who suffer from chronic illness, diabetic foot pain, and neuropathy, also often make repeat visits to the center, seeking treatment for a new chronic wound. Still, the center which focuses on all-around patient care, touts a 95-percent patient satisfaction score. Patients and center staff members often grow close during a patient’s treatment program, which often lasts, on average, six weeks. While the center offers a variety of treatment options and services, successful healing also depends on the patient’s participation in the healing process. It’s a team effort and patients must be willing to follow treatment guidelines. Those suggestions often include dietary and lifestyle changes that will ensure patients have the best opportunity to receive optimal results. Patients may be referred to the Advanced Wound Care Center by a physician, health care professional, or via self-referral. At the initial visit, the wound care provider will complete a history and physical, order any additionally necessary diagnostic tests, and determine a plan of care following evidence-based guidelines. As part of the overall goal to complete wound healing and overall patient health, the patient’s primary care physician will receive patient progress reports. The patient will be returned to their care after discharge. Treatment plans look at and focus on the causation of the wound, co-existing conditions that impact wound healing, and topical wound management. The wound care center at Cookeville Regional Medical Center is located at 205 N. Cedar Ave., next door to Middle Tennessee Surgical Specialists and is open from 7:30 a.m. until 4:30 p.m., Monday through Friday. To learn more about the center, call (931) 783-2626 or visit www.crmchealth.org.